1.1 To approve or decline an application for the naming of a new road as “Bills Avenue” in Stage D of the Bishopdale Subdivision. Approves the name of “Bills Avenue” for the new road in Stage D1 of the Bishopdale Subdivision. 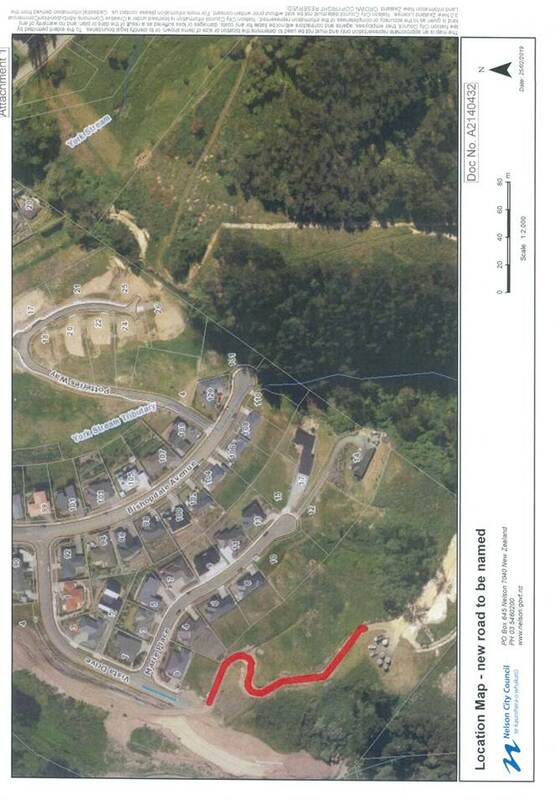 3.1 The applicant, Bishopdale Developments, has requested the name of “Bills Avenue” for the road extending off Vista Drive as shown on the Location Map (as highlighted in red on Attachment 1 A2140432). 3.2 The proposed name is the first name of Bill Gibbons, who founded the Gibbons group of companies and initiated the development of the greater Bishopdale subdivision. 3.3 The Council has the authority to name roads, pursuant to Section 319(j) of the Local Government Act 1974. 3.4.1 The name should not be the same as or similar to any other street in the Nelson and Tasman Regions. 3.4.2 Where appropriate, due regard should be given to historical associations within the City. 3.4.3 Where possible, the name should be consistent with other names in the area, or consistent with a theme in the area/subdivision. 3.4.4 The name should not be likely to give offence. 3.4.5 The name should not be commercially based. 3.4.6 The length of the name should be appropriate to the length of the street (i.e. short names for short streets - for mapping purposes). 3.4.7 The name should not be likely to cause semantic difficulties, i.e. spelling, pronunciation, or general understanding. 3.4.8 As a general rule, the proposed name should not be that of a living person, except in exceptional circumstances. 4.1 There are no similar road names in the Nelson City Council or Tasman District Council areas that are likely to cause confusion with this name. 4.2 The descendants of Bill Gibbons have given written approval for his name to be used. 4.3 The theme of naming roads after family members associated with the development is reflected in another name, “Marie Place”. 4.4 The proposed name does not conflict with any other criteria of the Road Naming Guidelines. 5.1.2 To decline the name of “Bills Avenue” and to ask the Developer to submit alternative names. The Council has the authority to name roads, pursuant to s.319(j) of the Local Government Act 1974. Our Council provides leadership and fosters partnerships, a regional perspective and community engagement. This is a low risk decision as checks have been carried out to ensure that the proposed road names will not cause confusion to the public or to emergency services, if there are existing similar names. · The Hearings Panel has the power to name all features within the city requiring naming including roads, streets, service lanes, plazas, parking areas, parks, reserves, gardens and all public facilities or infrastructure.